Watching Durham Bulls Baseball: 2013 Governors' Cup Champions! A team that hasn’t been hitting very well suddenly broke out and grabbed the Governors’ Cup! Eight of nine Bulls got at least one hit (and the one who didn’t, Tim Beckham, got a walk and scored a run). The Bulls got two doubles, two triples, and a home run. Meanwhile, Merrill Kelly has assured the Rays that he is a pitcher to watch. He had another solid outing to go in the trivia books as the guy up from AA (Aug 4) who was the winning pitcher in both the first and then the final round of the playoffs (note his ERA of 0.00, and only two hits last night). But he was backed up by a crew that kept the PawSox hitless for the final three innings. For myself, I have to note that in an exchange yesterday I said something like, “I think tonight’s game will be a blowout. I just don’t know which team it will be.” I guess Mr. Kelly settled that question for us all. As did the rest of that wrecking crew that poured out to celebrate a great, great game, playoff run, and season. 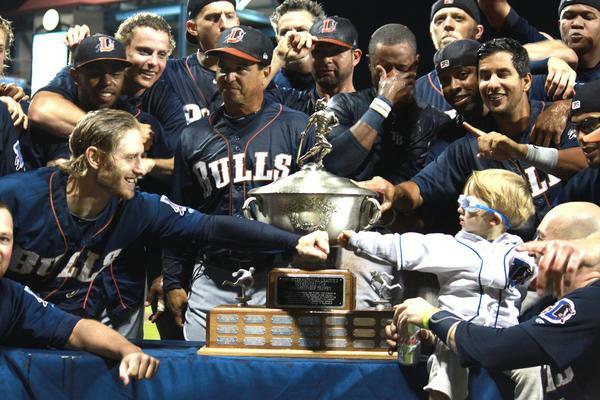 The Bulls are off to Allentown, Pennsylvania where they will play Kansas City’s AAA team, the Omaha Storm Chasers for the AAA championship. More about them later, but here and here are stories about their win last night. The Herald-Sun is reporting that Jake Odorizzi may start the game so that he stays on schedule for the Rays. Otherwise, it should be J.D. Martin.